Galaxy Hut has been unable to properly market itself for a long time. The biggest annoyance, though, is that you can’t see the music venue’s calendar unless you are a fan (or whatever they are calling it these days) on Facebook. Sure, this is easy/lazy for the booker, but it screws people looking to quickly check or for people who don’t participate in Facebook (dudes, the ‘net is about being open, not about giving away your private data). Galaxy Hut isn’t the only music venue with silly calendar practices. For example, Rock ‘n’ Roll‘s calendar page used to note that its calendar is not a reliable source of upcoming shows. And the problems don’t stop there. Other music venues fail basic spelling tests (Red and Black) or mobile technology (HR57), just to name a few current quibbles. None of these issues are much of a problem given the “quality” bands/groups these venues book, with the exception of HR57 (although it does feature a rather stale rotation). Plus, the vast majority of sites use a splash screen for some reason. Just to prove I’m not a total hater, Black Cat is always a reliable and informative site, as is Velvet Lounge, which I consider to be the best basic DC-area music-venue site. And to demonstrate I can criticize the things I still–because I’ve moved on from these scenes–I consider the Kennedy Center‘s page to be nearly unusable. This entry was posted in Other and tagged Black Cat, criticism, Galaxy Hut, HR57, Internet, Kennedy Center, music, Red and Black, Rock n Roll Hotel, Velvet Lounge, Washington DC on 2010/05/30 by Jason. I went to the Black Cat last night to catch Aquarium and discovered the new couch. In addition to its incredible newsworthiness, the new couch reflects the posh youth (i.e., college kids) that now frequents the Red Room. Well, apparently the Black Cat feels the new couch is also a big-time development as they are throwing a series of “couch night” parties (for the new couch, presumably). 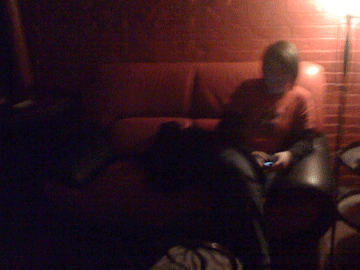 Here is a blurry photo of the new couch and a photo of the couch-party flyer. Enjoy. 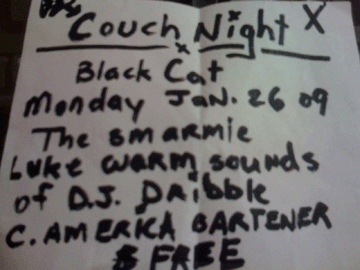 This entry was posted in Other and tagged Black Cat, couches, furniture, music, Red Room, Washington DC on 2009/01/26 by Jason. Black Cat Boosting Backstage’s Presence? Based on recent and, mostly, future Black Cat Backstage shows, it looks like the Black Cat is trying to up the visibility and profitability of the room. Note the better bands and higher prices. Interesting. This entry was posted in Other and tagged Black Cat, music, Washington DC on 2007/10/24 by Jason.